If wash day seems like a drag to you, consider some of these laundry room updates to make laundry chores easier. 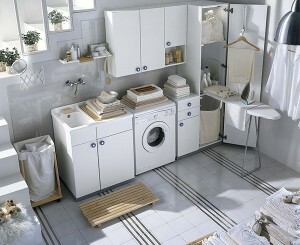 Creating a smart, efficient and resourceful space will make the burden of wash day disappear. Better yet, you don’t need a large space to improve your boring, inefficient laundry room. Brighten up your drab, basement laundry room with a fresh coat of white or light colored paint on the walls and ceilings. Paint the floor as well and add mats or rugs for safety and traction. Make sure they can be cleaned easily incase of unexpected spills or plumbing problems. Add a folding station where it is a small cabinet or other piece of furniture to serve as a counter. Folding laundry items as you pull them out of the dryer saves time and minimizes wrinkles. Give your laundry room a “first floor” feel by hanging long, light colored draperies or curtains to create the look and feel of a large window. Chose fabric intended for outdoor use. They will resist moisture and mildew that often builds up in basements. Install good lighting in/over your laundry station to make it feel bright and cheerful. If room allows add a small cabinet or counter top for folding and mending clothing items. Increase the convenience of your laundry room by adding a row or two of old-fashioned coat hooks. As you pull items out of the dryer, hang them on their own individual coat hook to minimize wrinkles, then take them straight to the closet to hang. Install plastic-coated wire shelving. It will put your wall space to good use and provide room to keep laundry supplies organized. Additionally, the wire and clothing rod are perfectly spaced/positioned for those laundry items that drip-dry. 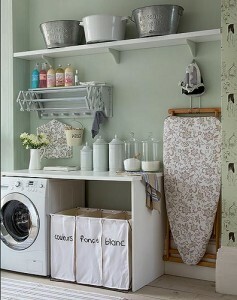 Create an instant laundry station by combining a wall hung cabinet with a laundry cart or similar cart on wheels. This handy combo will turn a small space into a convenient and efficiently laundry center. Store cleaning supplies in the cabinet and attached an inexpensive iron holder to the side of the cabinet. Hang a pull-out ironing board on the wall to save floor space. Use the cart for sorting laundry, storing clothing baskets, mending seams and sewing buttons.